February 2nd in the lectionary is a Feast day in the church; when Jesus is presented at the temple. The Bible text is Luke 22:22-40. In terms of speaking parts, the main characters are Anna and Simeon. They are presented in the Bible text as elderly. So today, in our intercession, we pray for elderly. Thanks for our parents and grandparents, those we know who have gone before us. Thanks for those in our congregations and placements who are Anna and Simeon, who are elderly. We name the reality of aging. We name the losses that can be physical, psychological, spiritual, financial, social and of autonomy. In every loss is grief and so we pray for grace. For space to name the changes and honestly confess the reality. In every loss is an invitation to change and so we pray for grace to be adaptable, to find God in the process of aging, to trace the grace of God’s presence in every day, in every breath, in every memory. In the way we pause with examen and seek your grace in our day, we pray that aging may be a step into the examen of a lifetime, and so an experience of grace, mercy and new hope. Thanks for those who care for the elderly, who provide meals, who offer medical advice, we pray. We ask for good humour, for people centred care. For those experiencing dementia and those watching people experience dementia, we pray for ability to find faith in a God who holds all memories. Erik Erikson calls this stage of life a journey into an age of integrity. In that sense we give thanks for Anna and Simeon, for their integrity as they waited in the temple, for their commitment to prayer, for their willingness to hope, for their ability to let go and trust the future to another generation. We ask that grace for the elderly. We ask that grace for the church. We have many congregations entering this age of integrity. We pray that like Anna and Simeon, they would have a commitment to prayer, a willingness to hope and an ability let go and trust the future – of their church, of their denominational identity, of their buildings, of their polity structures – to another generation. And so we pray for ourselves, that like Jesus in the temple, we will commit ourselves in this internship, to increase in wisdom, and in favour with God and in our intern placements. I found myself on Maori Beach, Stewart Island last week as the tide turned. I watched as the sea pushed the river backwards. I reflected on the power of water. It became a prayer, for mainline denominations in decline; and all those who serve in them. tide turn Stewart Island from steve taylor on Vimeo. Our research data on how churches respond to crisis got a second airing today, at the Chaplaincy in Aotearoa New Zealand conference. (The abstract of our paper is below.) It was good to co-present with research collaborator Lynne Taylor and we were grateful to the conference presenters for giving us the space. It is the second presentation in the space of a few weeks, having presented at the Resourcing Ministers day to around 120 Presbyterian ministers as part of General Assembly 2016 in November. The data set we are working with includes over 8,800 words of description regarding how over 150 churches prayed on the Sunday after the Paris tragedy. It means there is a lot we could talk about! Today, with a different audience, the presentation took on a different life. As part of the presentation, we also offered a takeaway resource, 8 examples of different ways that churches had prayed in crisis, including a brief commentary from Lynne and I as co-authors. Being chaplains, and being a smaller group, the questions and matters of engagement were very different. First, the complexity of us. There was affirmation of the theological reflection we had done in terms of noting the complexity of praying “forgive us our sins”; “deliver us from evil.” There is a need to think carefully about who is the “us” as we come in lament and intercession. Second, from the field of mental health chaplaincy, the importance of being sensitive to the re-living of trauma. Particular care needs to be taken in the use of images, given the power of the visual to trigger past pain. So the affirmation of those examples that used the auditory, rather than the visual, in providing ways for people to pray in crisis. Third, the importance of prayers for others including prayers not only for victims, but also for perpetrators of crime. This again, from a mental health chaplain, noting the importance of ensuring prayer was real and engaged the complexity of life. Fourth, the difficulty of praying for crisis in religious communities that lack a tradition, and thus a set of established and well-worn resources. Fifth, the enormous value of this type of research, in helping those who minister, to reflect on what they pray. This is a different, yet very life-giving type of research, that celebrates ministry and encourages the seeking of best practice. Having now aired the data twice, in two different settings, and had the affirmation of the relevance and importance of the data, it is definitely time to seek an avenue for publication. But after Lynne has finished her PhD! Chaplains often find themselves as a Christian presence in the midst of crisis. This can present a particular set of challenges regarding how to speak of the nature of God and humanity in tragedy. How to think of faith in the midst of unexpected suffering? What resources might Christian ministry draw upon? One common resource is that of prayer. Given lex orandi, lex credendi (the rule of praying is the rule of believing) such prayers – or lack thereof – can be examined as the articulation of a living practical theology. In the week following Sunday, 15 November, 2015, empirical research was conducted into how local churches pray. An invitation to participate in an online survey was sent to pastoral leaders in two New Zealand denominations: Presbyterian Church of Aotearoa New Zealand and Baptist Churches of New Zealand. An invitation to participate was also posted on social media. The date was significant because on Friday, 13 November, a series of coordinated terrorist attacks occurred in Paris. At the same time, a number of other tragedies occurred, including bombings in Beirut and Baghdad. Over 150 survey responses were received. In the midst of global tragedy, how had the church prayed? What might be learnt from these moments of lex orandi, lex credendi? This paper will address these questions. It will outline the resources used and the theologies at work. Particular attention will be paid to the curating of “word-less space”, given the widespread use of non-verbal elements in the data. The implications for those who pray in tragedy will be considered, with particular attention to the ministry of chaplaincy. 9:15 am Plenary: Hope gathered. How do churches respond to hard stuff? How did PCANZ churches worship and pray as they gathered on Sunday, November 15, 2015 in light of major international events? Steve and Lynne Taylor will present findings from their research into 160 churches, to explore how churches respond in gathered worship to hard stuff. What was practiced? How was hope understood? What theologies of God in suffering were at work? What does this say about being church in the world today? It is one thing to agree to speak. It is quite another to find something coherent, interesting, deep and engaging. I’ve been quietly mulling away, working on the data, which is SO interesting. But it also slips and slides in SO many directions. Where in all this is the creative points of connection that might open up the conversation. Today it clicked. Two separate conversations suddenly began talking to each other. How did churches pray after Paris? Well, I wonder how U2 “prayed after Paris”? The band after all were due to play in Paris November 15, 2015. The concert was postponed. When they returned The New York Times wrote: “The Paris show that concluded U2′s Innocence and Experience tour was concert as personal memoir, archetypal story, prayer, exorcism and vow of unity.” Hmmm. Prayer! How did they pray, live, publicly, in the midst of so much pain? I wonder what happens when the prayer life of U2 after Paris is put alongside the prayer life of churches? I have had, after all, work published on U2 and lament, looking at how they prayed publicly after the Pike River Mining Tragedy in New Zealand (Boase, E.C. and Taylor, S. (2013). Public Lament. In MJ Bier and T Bulkeley, ed. Spiritual Complaint: The Theology and Practice of Lament . Eugene, USA: Pickwick Publishers, pp. 205-227). I have also had work published on how U2 memorialise the dead (Taylor, S. (2015). Transmitting Memories: U2′s Rituals for Creating Communal History. In Scott Calhoun, ed. U2 Above, Across, and Beyond: Interdisciplinary Assessments , Lanham, Maryland, USA: Lexington Books, pp. 105-121.) In other words, I’ve already done some reading and thinking. This is a short survey that asks a set of questions regarding how the local church you attended responded to the Paris attacks of Saturday 14 November, 2015 (NZT). It should take around 5-10 minutes to complete. The research will be used in ongoing resourcing of church and worship leaders. Participation is completely voluntary. Unless you give specific permission to be contacted, all responses are anonymous. Please click on the following link. If that does not work then copy and paste the FULL URL into your web browser: www.surveymonkey.com/r/LCRSoc (It will NOT work to put the URL into a search engine). If you have any trouble email angelwingsresearch@gmail.com. Thank you (in hope) for participating in this research in understanding how local churches respond to global events. A feature of academic life is the sabbatical. It involves time away from the rhythm of teaching. It clears space for research and professional development. It is like compost. Adding layers of material, that over time, can be added to gardens; that over time, slowly add structure, enhance water retention and provide nutrients. So a sabbatical provides layers, that over the next season of teaching, enrich and advance. At Uniting College, faculty can apply for sabbatical after six semesters. I’ve been thinking for a while that we need some sort of team liturgy that marks the transition that is inevitable around sabbatical. This would help the person going and the people staying, providing a theological frame to a transition and underling values important to the organisation. A creationary: a space to be creative with the lectionary. For more resources go here. Lectio divina (divine reading) is a practice by which Scripture is read slowly, seeking for God’s voice. Today I invited the community at worship at Uniting College to enter into lectio decorio (reading the skin). (Decorio is latin for skin). The spark was the lectionary text – John 2:13-22, when Jesus cleanses the temple. Searching google, I found the work of Amanda Galloway. As a way to connect with women in India, a system of Biblical story telling has been developed. 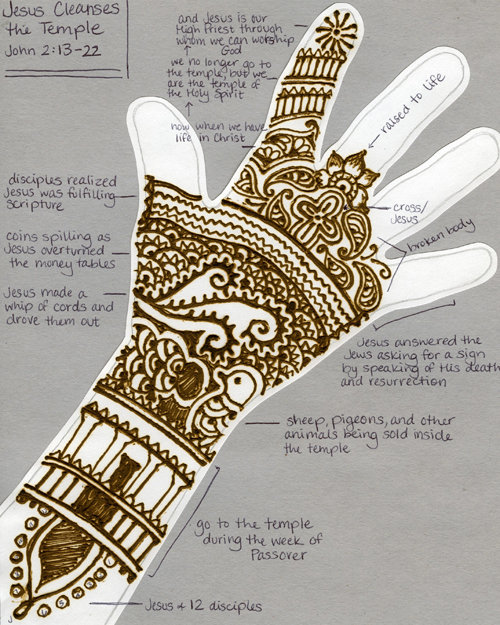 It uses the traditional henna process to symbolize biblical stories (I’ve blogged about henna and Biblical storytelling before). Henna, a temporary artwork drawn on hands and other parts of the body, is a popular beauty technique in parts of Asia, Africa and the Middle East. As the story is told, the images are drawn onto the hand and arm. I didn’t have the time (chapel is 20 minutes, including communion), nor the materials (henna), to literally use henna. But I loved the way the Amanda Galloway’s design told the story, and told it onto skin. It seeemed to also connect with the Biblical text, which was all about whips and overturned tables and thus a story about skin in the game of justice. So, after reading the lectionary text, I introduced the design. I noted how it is used. I then invited folk to trace the design onto their skin. 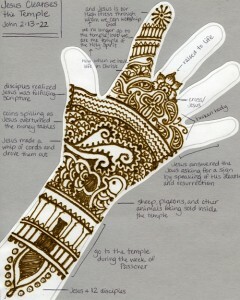 Not with henna, but by using their finger, while I read the text (slowly enough to give time for the tracing). And so skin touched skin, as the Bible story was heard and traced (decorio). I then repeated the process, inviting folk to trace to design on their other hand. Given that folk most likely initially chose their dominant hand, it felt deeply gospel to trace the design again, this time using a weaker finger. This also created links between the two contexts – us in the first week of the semester, with all the new learning that a semester involves, women in India, unable to read, but still opening themselves to learning. I then moved into the six minute communion. And suddenly the passing of the peace had new meaning. It was another moment of lectio decorio, reading the skin, as the gospel story traced on my hand touched the gospel story traced on the hand on another. I’m still to unpack with those gathered what the experience meant for them. But for me, the invitation three times to hear a Gospel story, the deeper sense of connection as that gospel was traced on my skin, the sharing of a practice from another cultural context as an expression of solidarity in learning – felt very embodied. So there we are, lectio decorio (reading the skin). This is the prayer I wrote for the launch of Rosemary Dewerse’s book, Breaking Calabashes, Becoming an intercultural community. In the name of the intercultural Christ, through the Breath of the inter-cultural Spirit, Amen. Some books are soaked in memories. I pulled Joyce Rupp’s Praying Our Goodbyes off the book shelf yesterday. It offers a range of ways to grieve. This includes a selection of rituals for different situations that life deals us – terminating a relationship, feeling betrayed, farewell, living with constant pain. And for each, some Scripture, some prayer, some action. The book has been so well used that as I opened it the pages fell out. I held them, remembering the times I’d used it – our struggles with infertility, twice in 9 months being turned down for a job I thought would be ideal, the pastoral transition away from a loved church family, some difficult work situations. And how different those situations seem now, 5 and 10 years later. Felt the pain, still. Yet realised, almost laughed in delight, at the different trajectories now in play. I’ve been enjoying reading Columba: Pilgrim and Penitent , by Ian Bradley – slowly, devotionally – over the past few weeks. Columba is a pioneer, setting off around 563 AD in a small boat with a few friends, from Ireland, to land on the west coast of Scotland. A little venture, that, with hindsight is now considered one of the most significant events in the Christian history of Britain. Columba was to found a monastery, now called Iona, which over the centuries was hugely influential. I’ve returned a number of times over the last weeks to one particular poem, attributed to Columba. At times at work without compulsion, This would be delightful. At times in a hermitage. It’s such a rich and varied life. A reminder that life to the fully emerges from full of a wide range of activities. For Columba, fishing, gathering food, mercy, solitude, work, prayer. And what is duilisc, you might wonder? Apparently an edible aquatic plant. Perhaps because I’ve become aware, suddenly, in the last week, that one of the children in Team Taylor sighs exactly like one of their parents. It’s uncanny. Perhaps, because I’ve found myself sighing quite a few times in the last week. Perhaps because, at the start of winter, in the last week of a semester, I’ve heard a number of the team, well, sigh. And we asked each other – what are you currently sighing over? Together we heard a wide range of life events. There was some good sighing. And some sad sighing. And some worried sighing. With a candle lit to remind us of God’s presence, it was a rich time. As part of the time, one of our team offered a reflection from their ministry practice. this passage. It is an act of deep empathy and prayer. Being in ministry is thus to sigh with the sighing. Pastoral prayer is sighing. So I’m off for the weekend. To sigh – to God, through Jesus. I’ve been enjoying Paul Bramadat’s, The Church on the World’s Turf : An Evangelical Christian Group at a Secular University (Religion in America Series) . He enters, as an outsider, as a researcher, an evangelical group on a University Campus. He spends 18 months worshipping with them, talking with them, interviewing them. He even goes on a missions trips with them. It’s a rich introduction to researching lived experience, the actual practices of groups of people. As a researcher, he notices the constant use of the word “just” in their prayers. Here is how he processes what he is observing. It’s most common syntactical location is near the beginning of the approximately half of the prayers offered … For example, a customary beginning of … prayers is “Fathergod, we just come before you tonight to,” a variation of which might be “God, we just want to sing your praises tonight because we’ve just seen all the wonderful things you do in our lives.” This term seems to muffle the students’ demands somewhat, underlining their indirect and humble approach to God. Without “just,” their prayers would be comparatively bold. For example, they would be reduced to the overly direct alternatives: “We come here tonight to” and “God, we want to.” … By implying that the speaker is unable to finish a prayer because he or she is overwhelmed by the opportunity to communicate with God … emphasizes his or her respectful love for and approach to God. That’s fascinating. The use of the word “just” reveals an inner humility toward God. I think it’s a wonderful example of research. It is so easy as an outsider to look down upon the religious practices of another. But Bramadat tries to understand not from his perspective, but from the perspective of the group. Preparing for Pocket lamp worship first, with Jonny Baker and CMS Pioneers, second with the mission shaped ministry Board, a few weeks ago got me thinking about Prayers of illumination. 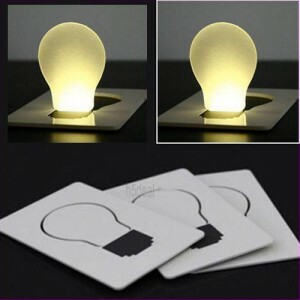 I think it was holding the pocket lamp open, thinking about light, and the phrase – prayers of illumination – sort of floated through my consciousness. Liturgically, a prayer of illumination is the prayer prayed before Scripture is read and spoken. In churches that consider themselves non-liturgical, it has a predictable pattern asking for God’s help as Scripture is preached, a predictable place just before the sermon and a performative dimension, inviting a focus on what is about to be said. In liturgical churches, when used (curiously more infrequently, in my experience, than in non-liturgical churches), it tends to be a set prayer, more likely to be varied, drawing from church tradition or various Scripture. May the words of my mouth and the meditation of our heart, be acceptable in your sight, O Lord, our Rock and Redeemer. What is interesting is the context, what comes in the 13 verses prior. You see, in the Psalm illumination comes from two places – nature and Scripture. The first six verses (1-6) reference illumination in creation – heavens, skies, sun, heat – all of these are proclaimers of God’s handiwork. From them “pour forth speech.” (19:2). As for example, in this “baptism” experience, or in this recent book release – Forest Church: A Field Guide to Nature Connection for Groups and Individuals by Bruce Stanley – which I am hoping to blog review chapter by chapter over the next few weeks. The next five verses (7-11) reference illumination in Scripture, and the hope of wisdom, joy and light. So, presumably when the prayer of illumination is prayed, it is invitation to consider both the Book of Nature and the Book of Scripture. And it suggests that the sermon that might follow will tell stories of human experience, offer insights from nature and reflect on Scripture. Perhaps in at least equal measure? Now that’s the type of prayer, I’d love to say Amen too. In community and in need of God. So a variant on pocket lamp worship would be to spend an entire service exploring Prayers of illumination. Place a whole lot up around the walls. Give people a lamp. Get them to walk, to read. Invite them to place their lamp beside the one that most connects. Share this in groups. Invite discussion on where God reveals Godself, on how discernment happens, both in practice and in the history of the church. Invite them to chose the prayer most meaningful, and pray it individually, at home, as they gather around Scripture. In so doing, the use of Prayers of illumination corporately would be enriched and renewed for another season of the life of the church. Creationary: a space to be creative with the lectionary (in this case, visual images on themes of pilgrimage). For more resources go here. Having returned from holiday over this weekend, my main task for the next 12 weeks is to write. (I have some research to do, but that takes second place behind my hope of completing a book – on sustainability in emerging and fresh expressions.) I face the 12 weeks with mixed feelings. It’s been 7 years since my first book and that breeds a certain sense of anxiety. I feel quite unsure if I can capture what I want to say. Will I be clear enough? Sustained enough? Academically able enough? Writing is such an individual experience. It feels so egotistical, this individual pursuit to be heard. Why might my words be worthy of being read? Why, in a world of so many books, should I pollute with yet more information? There are a whole lot of academic pressures at work – to publish, to get the right press, to be recognised. Again, a complex set of emotions and motives to sift. So this morning I found some phrases from Philippians 1:9 helpful. “depth of insight” – to write something that might, through God’s mercy, shine some light on the yet simply complex and complexly simple task of being a disciple in this contemporary world.